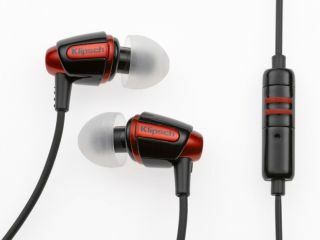 Audio specialists Klipsch has unveiled £90 ProMedia InEars which it claims takes its "intense sound philosophy and applying it to in-ear head phones for gaming." The ProMedia InEars offers noise cancelling design, hands-free mic and a VOIP/Gaming adaptor. The high-end headphones also feature patented oval ear-tips, durable tangle resistant cables and come in black with red accents. "Primarily intended for computer gaming, the ProMediaIn-Ear headphones add a new dimension to today's highly sophisticated online entertainment," explains Klipsch. "The single-button microphone offers crisp, clear communication for talking to enemies or collaborating with teammates during online gaming, and also makes these headphones a great solution for internet Skype calls and mobile phone usage." The gaming headphones certainly aren't on the cheap end of the range at an RRP of £89.99, but do come with a two-year warranty and a fair whack of audio credibility.